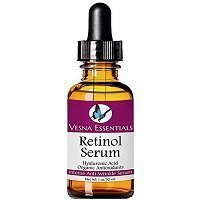 Vesna Essentials Retinol Serum is a very pricey retinol serum that didn’t help with my fine lines or wrinkles at all. The texture and feeling of Vesna Essentials Retinol Serum is super thin and liquidy. It absorbs into the skin super easily and leaves no gross residue on the skin. It’s very easy to apply; the dropper makes the application simple and easy to control the amount of product you use. You only need a few drops for the whole face and neck. After using Vesna Essentials Retinol Serum for a short period of time, there wasn’t much of a difference to my skin at all. After using Vesna Essentials Retinol Serum for a while, my skin became pretty irritated and broken out. My pores looked congested and enlarged and I had white heads on my t-zone. Not only did it cause my skin some irritation, but it didn’t help my fine lines and wrinkles at all. For such a pricey retinol serum I expected to see some benefits, but I really didn’t see any. Overall, Vesna Essentials Retinol Serum is a very expensive retinol serum that didn’t benefit my skin at all. I wouldn’t use this serum again. The texture and feeling of Vesna Essentials Retinol Serum is very thin and watery. It feels super light on the skin and absorbs almost immediately after applied to the skin. Vesna Essentials Retinol Serum is easy to apply; it comes in a bottle with a dropper applicator which makes it easy to apply and control the amount of product you use. Because this serum is so liquidy, you only need a few drops to cover your entire face, neck, and chest. Vesna Essentials Retinol Serum is so thin, and because of the watery consistency of this product, it absorbs into the skin very nicely. After you apply the serum, it absorbs into the skin and dries almost immediately. There is a very subtle scent to Vesna Essentials Retinol Serum; it smells a bit sweet, almost like sugar water. This scent is pretty non-offensive and goes away very quickly. After using Vesna Essentials Retinol Serum, I really didn’t notice any difference to my skin at all. After using Vesna Essentials Retinol Serum for a longer period of time, I didn’t notice any positive results. The main thing I noticed was my skin became very congested. My pores were enlarged and my skin was breaking out, but there was literally no difference to my fine lines and wrinkles or tone of my skin. This was a major disappointment. Vesna Essentials Retinol Serum is full of a ton of interesting ingredients, but a few that stood out to me were Hyaluronic Acid, Witch Hazel, and Aloe Vera. Hyaluronic Acid is an ingredient used in many retinols and anti-aging serums for its ability to lock in moisture and plump up the skin. This ingredient can make a big difference in the skin and overall texture and volume of the skin. Witch Hazel is an ingredient that is sort of a do it all type of ingredient. It can help the skin fight acne, help even out tone and texture, and reduce inflammation in the skin. By reducing the inflammation in the skin, it can help even out fine lines and wrinkles. Aloe Vera is known for its healing properties. The healing properties in Aloe Vera can help target fine lines and wrinkles to smooth them out and help prevent new ones from forming. It can also help restore moisture to the skin. The cost of Vesna Essentials Retinol Serum is $69.99 for 1 ounce of product which comes to $69.99 per oz. This is a very pricy retinol serum, especially because this one didn’t work well for my skin. Vesna Essentials Retinol Serum has a 100% satisfaction guarantee, so you can try this product risk free which is nice. To buy Vesna Essentials Retinol Serum, click here. Ingredients Aloe Vera has healing properties which can help with fine lines and wrinkles.